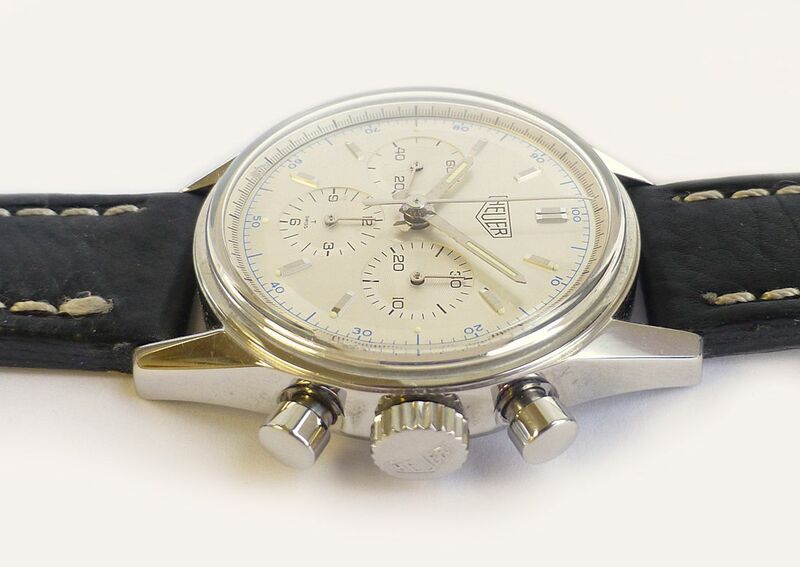 Mint condition stunning re-issue of the classic 1964 Heuer Carrera chronograph. 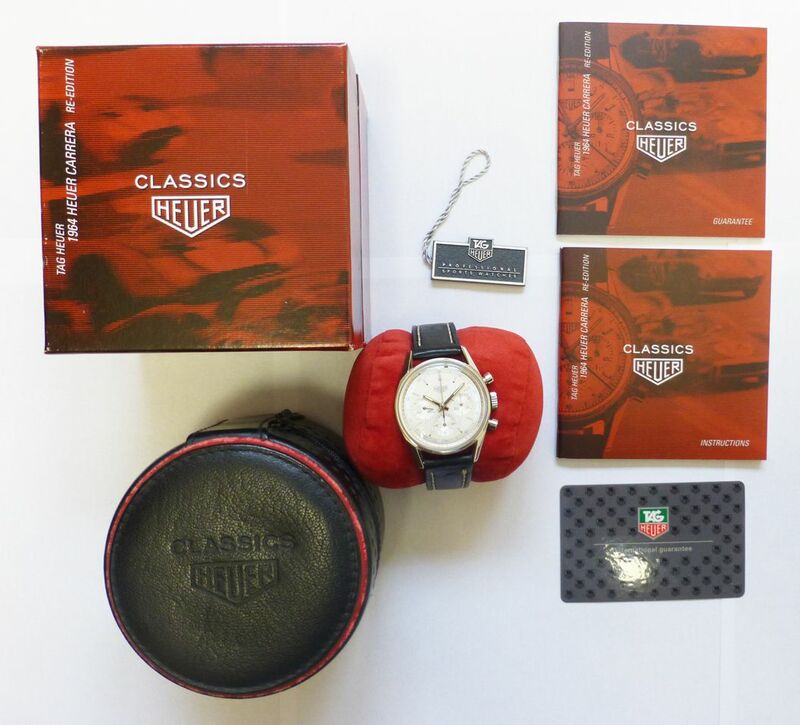 It comes complete with the correct Heuer Classics box and papers, originally purchased in 1998 from authorised dealers in Germany, Muhlbacher, long discontinued and fast becoming a collectors edition. 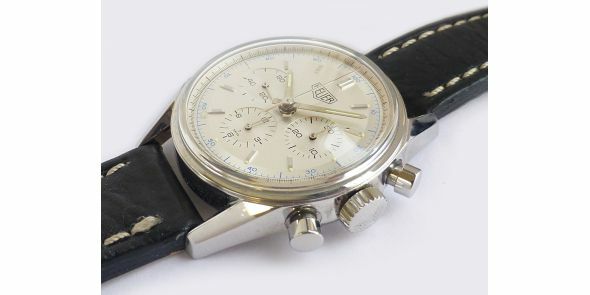 It comes on a replacement leather strap but retains the Heuer pin buckle. 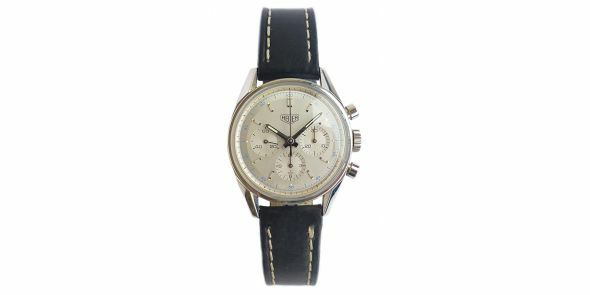 It is made by today's high technology standards, but using the older and one of the best designed watches ever made. 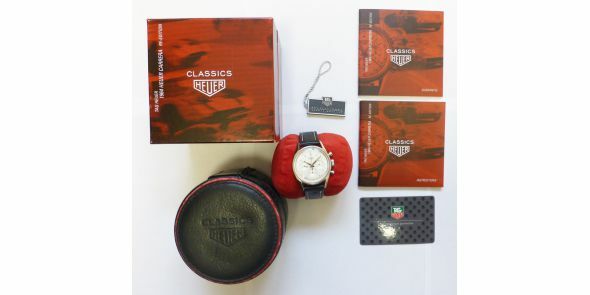 The case and dial is "the perfect one" with it's timeless design illustrating form, symmetry and function and a true classic that can endure the passage of time to look as if it could have been designed 50 years ago, or fifty years from today. It is not too big or too small, circular, no crown shoulders to throw it off balance, long angular converging lugs, polished stainless steel, and brushed stainless steel case back, easy to wind large crown, extended two tier and comfortably operated pushers. These features make it a true statement of what a watch should really look like. Likewise the dial is perfectly balanced and symmetrical in design. 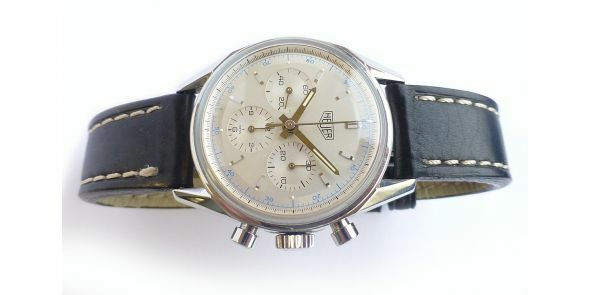 It has three sunken registers with concentric pattern, but not interfering with the chronograph calibration marks, silver applied baton markers and hands to match the case, beautifully offset by a silver dial with blue tachometric scale, giving the even more sporty look to it, also with matching 1/5th second iterations on white inner bezel. 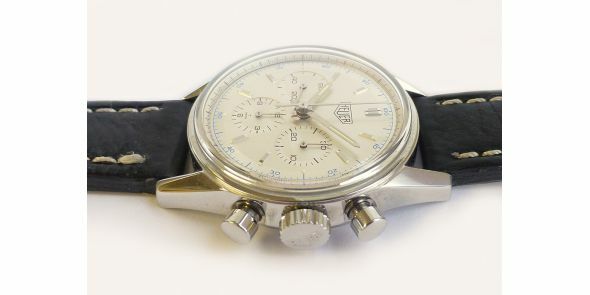 Large Heuer logo on the dial, crown and buckle and very large logo on the case back. 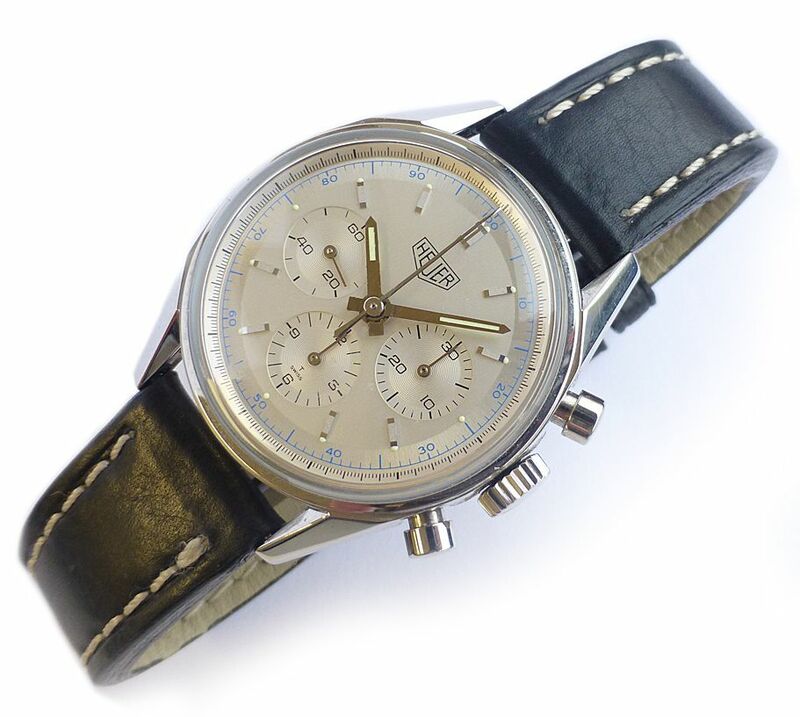 Comes on original strap which has some wear to it, but comes with new generic replacement black leather strap. The movement is the venerable and very rare manual winding Lemania 1873, with 18 jewels, 21,600 bph, monometallic balance, Nivarox spring and a power reserve 50 hours. 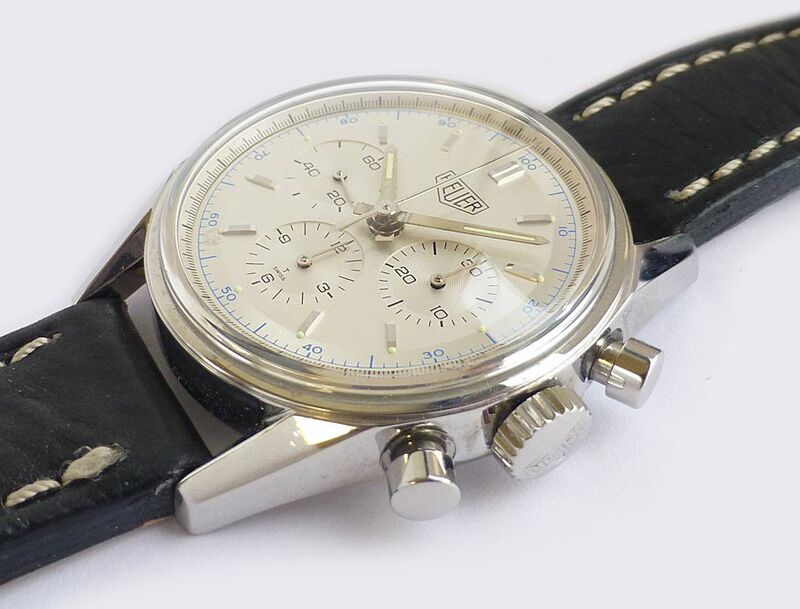 Three things that make this watch a collectors classic is that the logo says "Heuer" which were re-issued for a short period, it was then changed to "Tag Heuer". 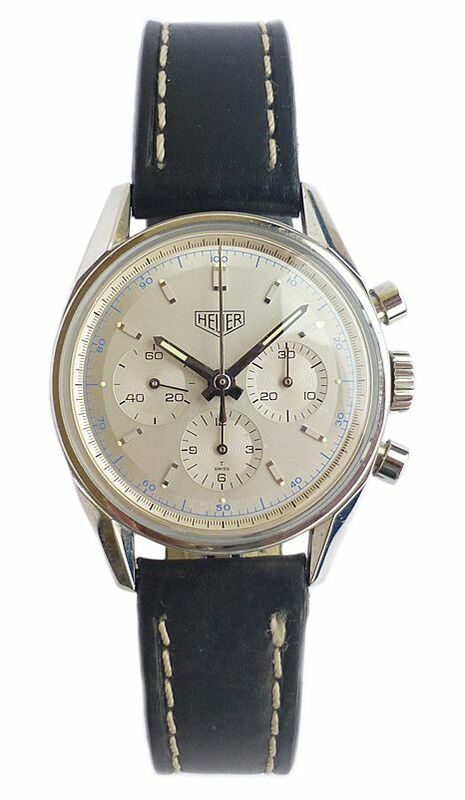 Heuer is undoubtedly a better name on the dial. 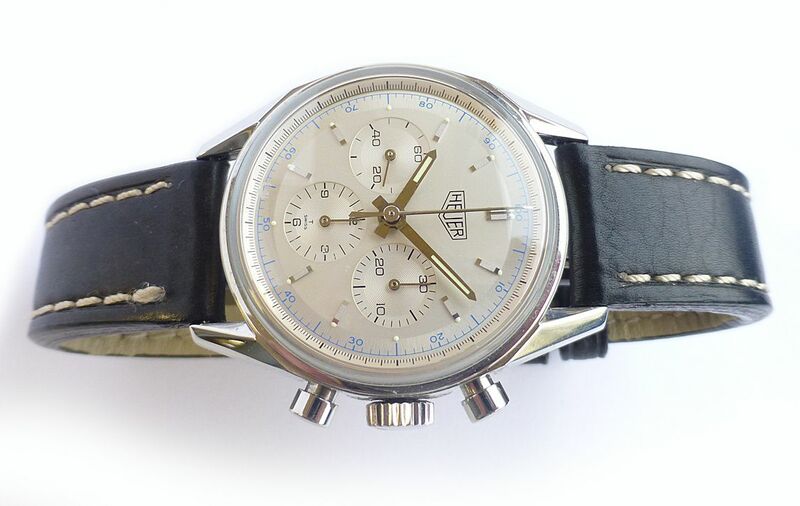 It also has the manual winding Lemania 1873 movement rather than the automatic Valjoux. 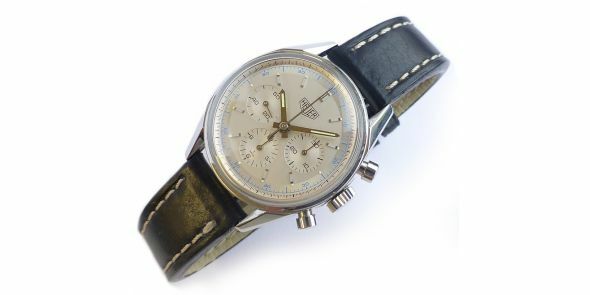 The Lemania is rarer, more desirable and collectable. Also it has got an acrylic crystal rather than sapphire. The acrylic crystal is true to form as it was like this on the 9164 vintage. Dimensions are: width is 35 mm excluding crown and 38 mm including crown, lug to lug is 44 mm, Thickness is 13 mm.